GSMArena team, 05 September 2012. It's a big day for Nokia today - it just announced the new crop of Lumia phones, which are the first members of the family to run on the new Windows Phone 8 platform. The future of the Finnish giant is riding on the success of these new phones, so the whole tech industry is watching with bated breath. The first device Nokia announced is the Lumia 920, "the most innovative smartphone in the world". 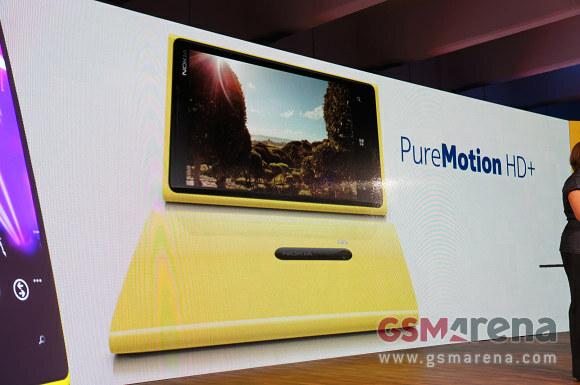 As expected, the camera has Carl Zeiss lens and Nokia's PureView technology. The 920 is the new Nokia flagship and promises better images and better video than competitors. It has an 8MP sensor, unlike the 808, but the PureView tech enables better image stabilization and better low-light performance. The phone also packs features like wireless charging with the Fatboy pillow (which has Qi tech inside), NFC, Nokia City Lens augmented reality app and so on. 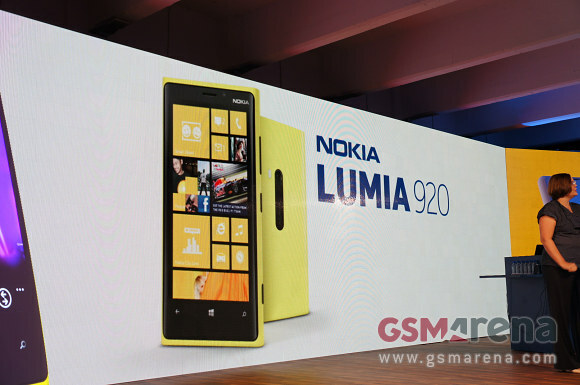 The second phone announced today is the Nokia Lumia 820. It's a more compact device than the 920 and uses a 4.3" ClearBlack AMOLED display with WVGA resolution. It's a polycarbonate unibody design too, but has protective shells that go on the back to add a new color to your phone or enable the same wireless charging you get on the 920. The camera is a 8MP shooter with Carl Zeiss lens, though it's not a PureView camera. It still gets some of the interesting new camera features that Microsoft just showed off. Microsoft had some new features of Windows Phone 8 to announce too, so it's not just new hardware that we saw today. Join us on the next page for the Nokia Lumia 920 hands-on. The Lumia 820 live photos, garnished with our first impressions are on page 3.